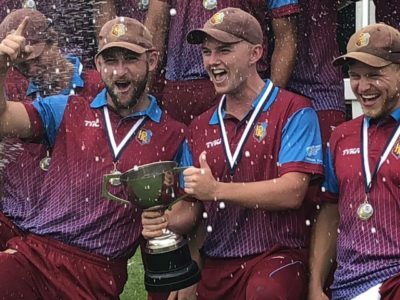 The Marie Raos Ray White Howick Pakuranga Premier Men came out on top over Takapuna on Sunday in the T20 Final at Eden Park, victors by 67 runs. Things went right from the time Howick captain Andrew Morrison won the toss and elected to bat on a wicket just made for cricket. Openers Matt McEwan and Dan Young showed they meant business from the first ball which McEwan hit for 6. When McEwan was finally dismissed for 56, scored off 36 balls including 5 sixes, the Alpacas’ score was 77/1 after 7 overs. Young continued on to score 37 and took part in a partnership of 69 with Morrison and, just as the run rate started to drop, Dale Phillips added a quick 20 the total. After 20 overs Howick had scored 179 which left the match evenly poised, especially with such small boundaries. However it was clear that the Alpacas came out to win and Jamie Brown broke through in the second over. This was followed by Danru Ferns winning an lbw decision over one of Takapuna’s key batsmen, Max O’Dowd, with his first ball.and he followed this up when Brian Barnard took a magnificent catch over his shoulder to dismiss captain Will O’Donnell and at 20/3 after 4 overs there was really no way back for Takapuna. Howick’s bowlers all bowled tight attacking lines and backed this up with superb fielding, never letting up on the pressure and, after only 16 overs, Takapuna were all out for 112. Jamie Brown ended with 4/26 which included the big wicket of James who had scored 32. The match was well supported by Howick Pakuranga members who got noisier as the match progressed and the celebrations continued well into the night. It’s been a long time coming! Howick Pakuranga Premier Women have moved to the top of the table in the Pearl Dawson T20 Championship with two big victories on Saturday. In the second match against Takapuna, Howick scored 194/5 after its 20 overs. Rhadika Patel top scored with 73 off 57 balls, supported by Tasha Van Tillburg with 46 off 23 and Amberly Parr 29 off 19. Takapuna was rolled for 48 by a determined bowling attack with Alyssa Bowden 5/11, the star and good returns from Marama Downes 3/4 and Rae Allright 2/5. A great win over last year’s champions! The earlier match against Papatoetoe was a bit closer although it seemed the Howick Ladies more or less had it under control. The Llamas batted first and after 20 overs had scored 145/7. Wicket keeper Lucy Western held the innings together with 43 off 38 balls and there were useful contributions from Van Tillburg 19 and Parr 27. Papatoetoe lost early wickets and looked in all sorts of trouble. After 4 overs the score was 25/6. While wickets were falling, Lagi Talea scored 75 off 50 balls but none of her team could stay with her. Papatoetoe was dismissed in 10 overs for 104 with Howick winning by 42 runs. Josie Penfold had a stunning return of 5/14 off her spell with Bowden and Parr both taking two wickets each. After four rounds, Howick Pakuranga Premier Women lead the points table for the first time in its five years in the grade. Signs of good things to come!